The best green laser for AR 15 is absolutely a lucrative investment for target shooting and hunting enthusiasts and those in law enforcement. There are new models of green laser for your rifle and you want to get one but the problem is that you don’t know where to start. We created a list of the most important things to look for when planning to make a new purchase or upgrade your old rifle accessory. The best rifle laser should not only suit your allocated budget for the purchase but must also offer high-quality results. Do not settle for ridiculously cheap units that are quite questionable when it comes to their overall performance. The ideal riflescope with green laser design for your AR 15 should strike a balance between quality and cost efficiency. Beileshi 3-in-1 Green/Red Laser Sight. This green laser by Beileshi is on the higher end of our price scale but the extra cash you’ll need to shell out is worth it as the tactical riflescope offers a smorgasbord of functions. It is not just a green laser but the useful 3-in-1 also highlights the holographic reticle with a green/red dot and a dual illuminated red laser design. AOTOP Tactical Riflescope with Red/Green Laser. 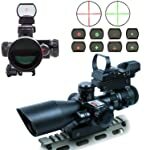 The mid-range tactical rifle scope is also loaded with other functions just like its Beileshi laser sight counterpart. It is also a dual illuminated green laser mil-dot complete with rail mount and a green/red dot open sight. The weave design on the reflex sight is, however, something that the other model does not have. Ozark Armament Green Laser Sight System. Even if it is at the lowest range in our price scale, the green laser sight system from renowned manufacturer Ozark Armament is never inferior to the Beileshi and AOTOP models. The reasonably priced green laser for your AR 15 rifle is fully equipped with the Picatinny rail mount along with the on/off switch options for shotguns and rifles. The best way to gauge the quality of the best green laser for AR 15 is through its performance, especially on the field. A high-performing green laser boosts your target acquisition and precision with the help of the innovative technology used and integrated into the product’s overall construction. AOTOP Tactical Riflescope with Red/Green Laser. The black matte rifle scope highlights its 2.5x-10x magnification and the brand new 40mm riflescope design with red laser option. It boasts of the integrated weaver-style mount for a polished look and guaranteed secure mounting while the multicoated optical sight ensures clarity of vision throughout your entire range. Ozark Armament Green Laser Sight System. Unlike the AOTOP riflescope with red and green laser and weaver rail that lets you attach a powerful device such as a flashlight atop the scope, the green laser sight system by Ozark Armament does not really have that kind of flexibility in its design. It is, however, a great option if you want a green bright and large dot with convenient adjustment and effective zero in capacity. Beileshi 3-in-1 Green/Red Laser Sight. With multiple functions and usability, the Beileshi laser sight is fully adjustable as well as independently controlled for maximum performance on the field, features that are not offered by its AOTOP and Ozark Armament green laser counterparts. The red and green dot sight is good and performs quite well when zeroed to your desired range. The scope is accurate and lets you quickly acquire the target with seamless precision. One of the most important things to consider when choosing a green laser for your AR 15 rifle is its durability and ability to last for years even when subjected to the harshest of outdoor or field conditions. Beileshi 3-in-1 Green/Red Laser Sight. 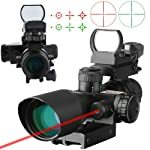 The powerful combo of the green/red laser sight makes it a high-performing unit, however, there is no substantial information as to the warranty of the product from the manufacturer. You would have to talk to the retailer or distributor of the unit that you purchase it from in terms of customer protection against factory and product defects, return policy, and refund. AOTOP Tactical Riflescope with Red/Green Laser. The red dot and laser may not be military-grade to withstand harsh conditions and tough demands while you’re on a challenging terrain or field but it gets the work done. The lenses are multicoated so you can expect a shockproof, fog proof, and waterproof performance. Just like Beilishi, the warranty information for the product is also not provided. Ozark Armament Green Laser Sight System. The durability of this product is mainly highlighted particularly with its exclusive reinforced and redesigned technology that handles the rifle even when subjected to the toughest recoil. The unit is made from aircraft-grade aluminum materials thus it is crafted to last without any significant issues over time. Unlike Beilishi and AOTOP, manufacturer backs its product with the full 1-Year Limited Warranty. Just like other combat or target shooting accessories such as a compass watch, the green laser sight should also give you user-friendly features for hassle-free operations. Ozark Armament Green Laser Sight System. The unit is designed with a quick and easy visual targeting design that is developed for rifle platforms. The rail attachment contributes to the effective optics of the product with good eye relief and accuracy. Beileshi 3-in-1 Green/Red Laser Sight. The product also promises target acquisition and precision but unlike the Ozark Armament sight, the Beilishi model guarantees full adjustment and design that you can remotely control the unit for better access. AOTOP Tactical Riflescope with Red/Green Laser. The red/green laser is easy to configure especially for close quarters and ranges. It comes complete with the manual instruction, cleaning cloth, mounting tools, and other accessories, something that the Ozark Armament and Beilishi models do not offer. The first step to update your arsenal, whether it is a green laser scope or gun holster or other weapon accessories, would be to check and compare the best picks on the market selection based on the most important criteria to look for. There is no single product that could cater to all unique needs and preferences of individual riflescope users, however, the best unit should dominate in not just one but multiple categories. We highly recommend, Ozark Armament Green Laser Sight System as the best green laser for AR 15 as it dominates two of the important criteria we have, and those are the fields of Affordability and Durability. The product enjoys the best of both worlds, giving you a budget-friendly purchase without sacrificing overall quality and performance.